LEADING Ayrshire chartered accountants Sinclair Scott have completed the major operation to switch the hosting of the firm’s entire IT infrastructure, including applications and client data, to a specialist hosting provider. 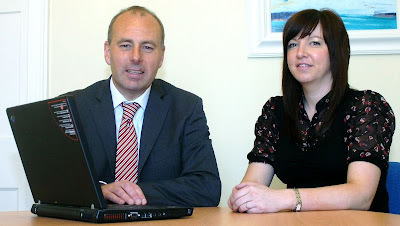 Sinclair Scott was created following the merger of two Ayr-based accountancy practices, Alfred T. Scott and Sinclair Maclean, in early 2007. The new practice, which employs 20 people, provides local businesses with traditional auditing, accounting and tax services as well as advice on how to improve and develop their business. Prior to their merger, both accountancy practices were already using IRIS accountancy practice software with great success. When the two firms merged, they turned to IRIS to integrate their respective IRIS databases into a single, shared solution. At this stage, and in part due to space constraints in the shared office, Sinclair Scott used IRIS to help transition to a paperless office. By digitising all documents and records, they were able to eliminate much of their physical onsite storage and provide sufficient space to accommodate the entire team. Although Sinclair Scott had already achieved a number of efficiencies with IRIS, it was clear that the firm’s ageing IT infrastructure would need to be updated. In particular, a new server would soon be needed to run core business applications, which included IRIS APS, Microsoft Exchange and Office, and file and print services. The firm’s growing IT needs also meant that day-to-day technical support was a concern. Although the firm used a reliable and cost-effective IT contractor for onsite support, fee-earning staff were inevitably impacted when things went wrong. The company’s backup and recovery needs had also grown. Up to that point, Sinclair Scott relied on employees to manually backup the server to tape, which was itself then taken off-site in the event of a disaster. If the server did fail, or a file was lost, the tape would be used to recover what was needed – but it was a lengthy process and would cause significant disruption to the team’s working day. While evaluating options for a replacement server, Andrew Sinclair realised that the practice’s IT needs had reached a tipping point. While he needed first class infrastructure, service and support he knew this would require a considerable investment if this was to be owned, run and managed in-house. He began looking at the possibility of hosting his entire infrastructure, including applications and client data, with a specialist hosting provider. Andrew’s research showed that hosting would give the business the quality infrastructure it needed as well as far greater resiliency in the event of any failure. It would also be managed by professionals with a guaranteed service level agreement that would ensure minimal, in any, disruption to the business. Additionally, the long-term costs of hosting were calculated to be less than purchasing and running everything in-house, to the tune of several thousand pounds a year. Despite the clear advantages of hosting, Andrew was reluctant to hand his IT to a third-party with no understanding of his specific business needs. Ideally, knowing first-hand IRIS’s commitment to customer service, he wanted to turn to IRIS as Sinclair Scott’s hosting partner. As a result, Sinclair Scott became the first IRIS APS customer to switch to the IRIS Practice Hosting solution that was officially launched in late 2009. By switching to IRIS Practice Hosting all Sinclair Scott’s IRIS software and other desktop applications, including Microsoft Office and Outlook, are now securely delivered as a service, over the Internet. In addition, IRIS also supports and hosts third party applications used by Sinclair Scott, including: Sage Payroll Professional, scanning software, dictation software and Blackberry BES. By hosting the entire practice’s applications and data on dedicated, powerful servers in a highly secure and scalable data centre, there was no longer any need to have expensive IT equipment in its office. “The only technology we now need at the office are PCs to access the server. Where we used to spend £1000 or more just for a single, highly-specified PC or laptop; that cost has dropped to less than £300,” said Andrew. In addition, as part of the Hosting service, the IRIS support team update the IRIS Practice software and other third party software, to ensure Sinclair Scott is compliant with the current HMRC regulations. Furthermore, IRIS aids Sinclair Scott’s compliance with various UK Government laws, including the Data Protection Act and the various emerging laws and guidelines regarding email data retention. Andrew also cites the additional benefit of accessing the server securely from anywhere with an Internet connection, making working from home a viable option as well as increasing productivity when visiting clients. “During the winter blizzards across the UK, our hosted approach gave staff the opportunity to work from home and continue as normal without having to risk the elements to get into the office,” added Andrew. IRIS’s technology partner CI-NET handled the switch to the hosted service. To avoid any disruption to the business, data was transferred over a weekend from the server at Sinclair Scott’s offices to IRIS’s hosted data centre in Milton Keynes. The IRIS Practice Hosting solution also offered Sinclair Scott a completely new level of resilience, availability and security. Connectivity was ensured by two Internet connections at Sinclair Scott’s offices as well as a mobile broadband option. Fear of server failure has also become a thing of the past, since IRIS Practice Hosting is based on a server structure that is not compromised by a single server failure. This greatly reduces the risk of downtime and ensures the practice runs 24/7. In addition, IRIS Practice Hosting offered an impressive Service Level Agreement (SLA) with a dedicated support team on call to help deal with any problems. Lastly, when it comes to backup, no one is taking tapes out of the office every day. Instead IRIS Practice Hosting provides regular, automatic server backups and takes this data off-site for additional security. Andrew Sinclair knows that the hosting solution is saving his practice money over the long-term. By avoiding the typical capital costs of an in-house solution, the practice has significantly improved cash-flow, a bonus during challenging economic times. Even more than the direct cost benefits, Andrew highlights the fact that by taking IT out of the office, he and his fee-earning colleagues are able to spend more time servicing their clients. He estimates savings of more than £5,000 each year. There are currently 710 Ayrshire business stories permanently archived on this site. To locate those of most interest to you, please use the site search facility in the top left hand corner of this page. Type your search term in the white box, then click the magnifying glass symbol.